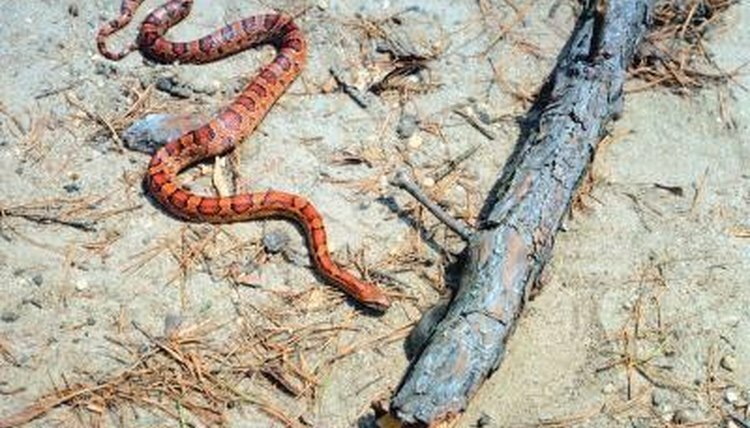 Corn snakes shed their skin throughout their lives, but do so several times before reaching adulthood. Corn snake hatchlings are between 8 and 12 inches long, while a full-grown corn snake ranges in length from 2.5 to 5 feet. Juvenile snakes don't have to grow much beyond hatchling size before the first shedding starts. Corn snakes are born fully developed, with juveniles reaching their mature size at about age 2. How much they shed before reaching adulthood depends on the amount and quality of food available. Since rodents are their primary food, the more small mammals a juvenile consumes, the more often he will shed. With each successive shedding, the skin becomes more colorful and the patterns stand out more. If you keep a pet corn snake, you can tell when he's about to shed his skin. A few days before he sheds, his skin becomes dull and turns a bit white, while his eyes turn bluish. The eyes are key -- once they clear, he'll shed his skin. The PetMD website recommends providing your snake with a shallow dish of slightly warm water for soaking while shedding. How Long Does the Average Corn Snake Grow? What Different Things Can Corn Snakes Eat?